Epic’s’ Lead Technical Animator Chris Evans discusses the process of bringing one of the world’s most recognized pieces of art into virtual reality. 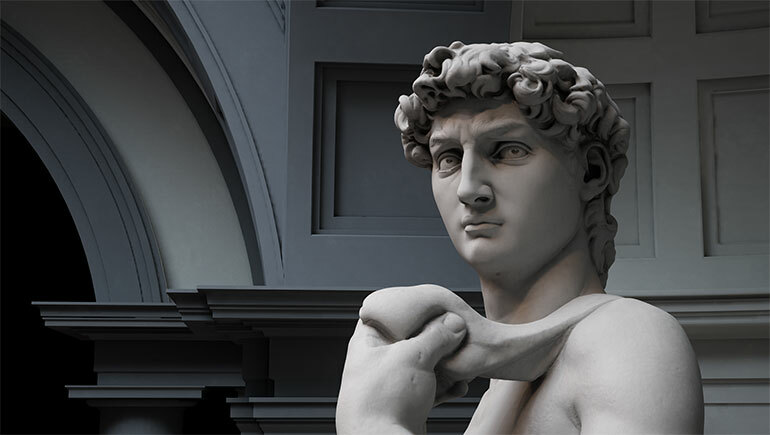 In 1998, Marc Levoy lead a team from Stanford to scan Michelangelo’s David in Florence. Over the years, this dataset has been used by many papers presented at SIGGRAPH, but since it totals in more than a billion polygons, it’s never been viewable in real time. I am a bit of a Michelangelophile. I actually have a plaster cast of David’s face at home, taken from the statue in 1870 when it was moved. 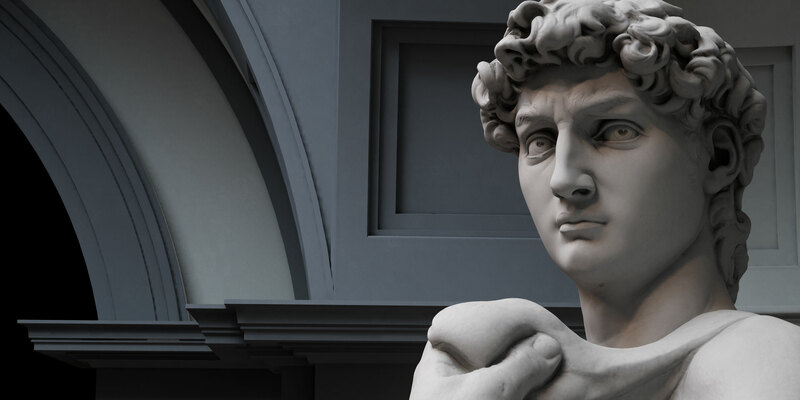 I have studied Michelangelo for many years, and I find his life and works really intriguing. At one point I was told that I have more books on Michelangelo than the Staedel Art Library in Frankfurt! As the Games Program Chair for SIGGRAPH 2017, it was my job to try and get unique and interesting experiences powered by game engines into the conference - experiences like Shane Caudle’s Ghost Paint, the rear-projected VR spray paint exhibit. I really tried to think of other uses of VR that could allow attendees to experience things they haven’t yet seen. And then it hit me, what if I could somehow get the Stanford David dataset in VR and allow any attendees to ride a scaffold right up to his face? I contacted Marc Levoy from Stanford, and he agreed to allow us to try and create this experience for SIGGRAPH 2017. Over six months, and with the help of Adam Skutt, a character artist at Epic, we baked the dataset onto an in-engine representation, down to the quarter millimeter! 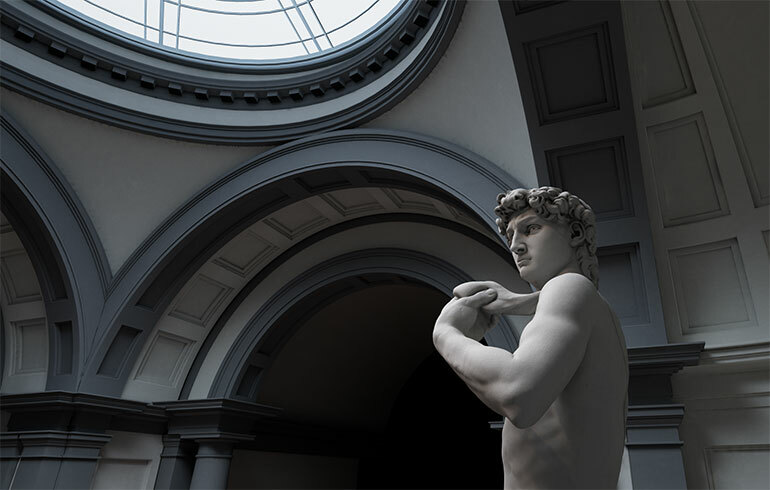 I modeled the interior of the Tribune at the Galleria della Accademia in Florence, where the David is housed, and created the level allowing people to ride a scaffold up and down while walking around the statue. 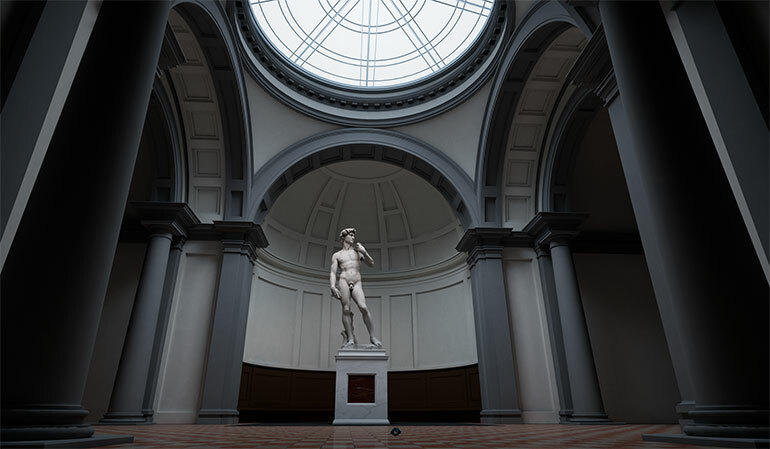 Peter Sumanaseni, senior technical artist at Epic, lit the scene using lots of photo reference and information about the skylight given to us by Victor Coonin, the world expert on the David. In the end, the piece was well received at SIGGRAPH 2017. There was always a line to see it and many people said it was the best VR experience they saw at the show. This was really a humbling experience, but going into it I knew that it would provide a unique and interesting opportunity to profile this famous piece of art. I was glad to see that others felt the same way.